The last refuge of the Mac-hater is to point out that Macs are “disproportionately popular” in the United States. What is meant by this is simple: Macs are American computers, and Macs are cheaper in America, therefore the fact that Apple has a higher market share in the US than internationally “proves” that their popularity is an aberration. As bizarre points go, it’s not too bad. Macs are American, by design at least, and indeed cost less in the US than abroad (though the fact that US prices are quoted minus sales taxes exaggerates this somewhat**). In fact, it’s even true that Macs are proportionally more popular in the United States than they are globally. Currently Apple has a 6.4% market share in the US and accounted for 7.2% of PC sales in 2009. Taken globally, market share naturally drops. The most recent figures put it at around 3%. Not all countries are equal, though: in one major market, the United Kingdom, Macs account for 5% of computers in use. But the raw numbers don’t tell the whole story. The PC revolution didn’t occur at the expense of the Mac largely due to Apple’s niches in publishing and, back then, education. The explosive growth of DOS and Windows in the early 1990s actually occurred at the expense of the Commodore Amiga and Atari ST, which were the then dominant home computer platforms. Of course, in the pre-Internet days, the home computer market was a fraction of what it was to become, so arguably a lot of the PC’s growth was due to new buyers and thus not at the expense of any platform. None of this can disguise the fact, though, that Apple had some bad years in the UK, principally from around 1995 onwards. In the dark days of the mid and late 1990s, Apple’s education market share shrank dramatically even as Acorn, the traditional supplier to UK schools, left the market, losing out to Windows 95 and 98, leaving “creatives” as the sole significant users of Macs – apart from the odd Apple loyalist, that is. Want to buy a Mac or Mac software? Don’t bother going to the local computer shop; they won’t have any. The big out-of-town PC warehouse, meanwhile, will have a few (but no support) and sales staff on juicy commissions from PC manufacturers. With authorised Apple resellers dropping like flies during the late 1990s, the only way to guarantee a good selection of Macs or Mac software was to buy a specialist Mac magazine and use the mail-order ads. One former Mac magazine editor remembers the days very clearly. Ian Betteridge, late of MacUser, says the perception of Macs, and indeed the market itself, has changed radically in the past decade. 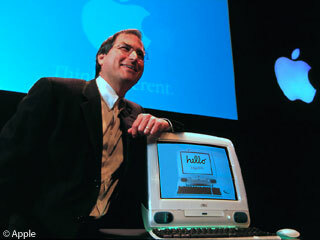 “The perception of the Mac has changed completely. Back then, the Mac was widely regarded as ‘that machine that designers use’ – and even some publishers were moving away from it,” he says. (Betteridge was interviewed by Low End Mac contributor Dirk Pilat in 2002). How times have changed. The release of an iPod compatible with Windows in 2002 resulted in a lot of chatter about the so-called “halo effect”. The basic idea was that people would like their iPods so much that they’d end-up buying other Apple products – specifically Macs. Guess what? It turned out to be true. Either that, or the endless amounts of publicity and buzz surrounding Apple finally got Macs in front of enough people. Either way, the iPhone and iPad certainly haven’t hurt perception of Apple as a business or Macs as products. “The launch of the iMac started the change in perception, but it really started to change when the iPod, and later the iPhone, launched. They dragged the perception of Apple generally out of the design ghetto and into the mainstream – and that’s affected how the Mac is perceived too,” says Betteridge. There were other factors, too, including both Mac OS X and Apple’s industrial design. Certainly, the original iMac pioneered the idea that if a computer is going to sit in the living room, it shouldn’t look (or sound) awful (though, in fairness, many Apple designs down the years have been innovative and interesting, if rather more understated). Today, Macs are seen as both a legitimate computer (no more “Fisher-Price” jokes) and a lifestyle choice – and this is no different in Britain. * The phrase was popularized in the US by Mark Twain, who attributed it to Benjamin Disraeli. However, the phrase is not found in any of Disraeli’s works, and the earliest known appearances were years after his death. The statement first appeared in print in 1891. ** State sales tax rates in the US range from 0% (in Alaska, Delaware, Montana, New Hampshire, and Oregon) to 8.25% in California. With the addition of local taxes, this can reach as high as 11.5% (in Illinois).